Team Suzuki Press Office – June 29. Yoshimura Suzuki MOTUL Racing has announced its four-rider line-up for the Suzuka 8-Hours World Endurance Championship fifth and final round that takes place at Suzuka Circuit in Japan on July 29th. Suzuki MotoGP test rider Sylvain Guintoli and British Superbike rider Bradley Ray will join All Japan Superbike and Suzuka 8-Hour regulars Takuya Tsuda and Kazuki Watanabe aboard the Yoshimura Suzuki GSX-R1000 as the team competes in its 41st event. “It will be the 41st Suzuka 8 Hours for us! This event has been in the world championship series ever since 1980. Back in 1976 to 1978, Honda RCB was called an ‘Unsinkable Fleet’ in the World Endurance Series in Europe and the first Suzuka 8 hours in 1978 was going to be Honda’s ‘Homecoming Victory’ as many of the Japanese fans had never seen RCB in their home country – but it was not. “Racing fans always remember that Yoshimura beat the factory teams and won the first Suzuka 8 Hours! We do not know what sort of drama we may encounter during the coming 8 Hours as we finished the race in seventh place overall despite a second lap accident last year. Nonetheless, Yoshimura Suzuki MOTUL Racing was rewarded the ‘Anthony Delhalle EWC Spirit Trophy’ by the race organisers for our fighting spirit. “Yoshimura Suzuki MOTUL racing is going to take part in the 41st FIM Suzuka 8 Hours Endurance World Championship. 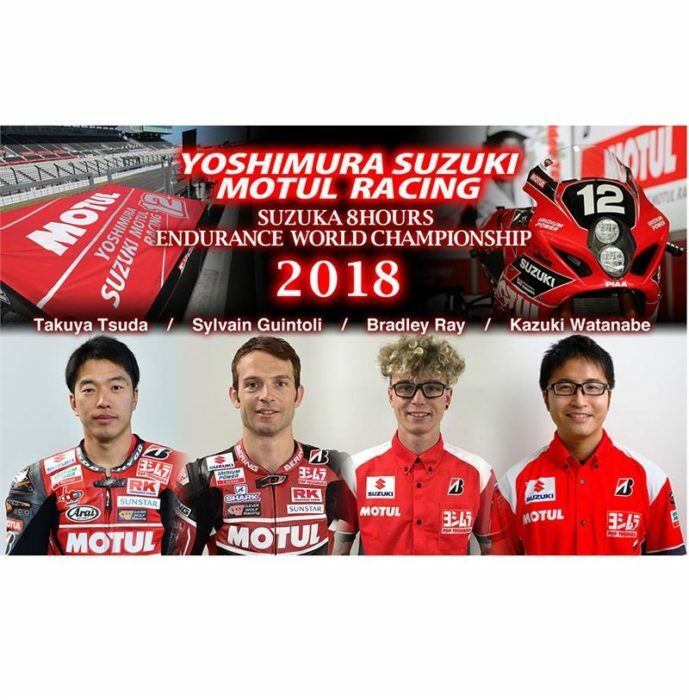 Yoshimura Suzuki MOTUL Racing is calling four riders, Sylvain Guintoli & Takuya Tsuda, the Suzuki MotoGP test riders, Bradley Ray, one of the most distinctive riders in the British Superbike, and Kazuki Watanabe, the new Yoshimura JSB1000 rider.